New comics & merchandise available this Wednesday! This entry was posted in General Info on January 27, 2014 by admin. Want to purchase an item and it is not available on our website? and we'll put it on the website for you! This entry was posted in General Info on January 20, 2014 by admin. James Spence to Appear at Royal Collectibles! 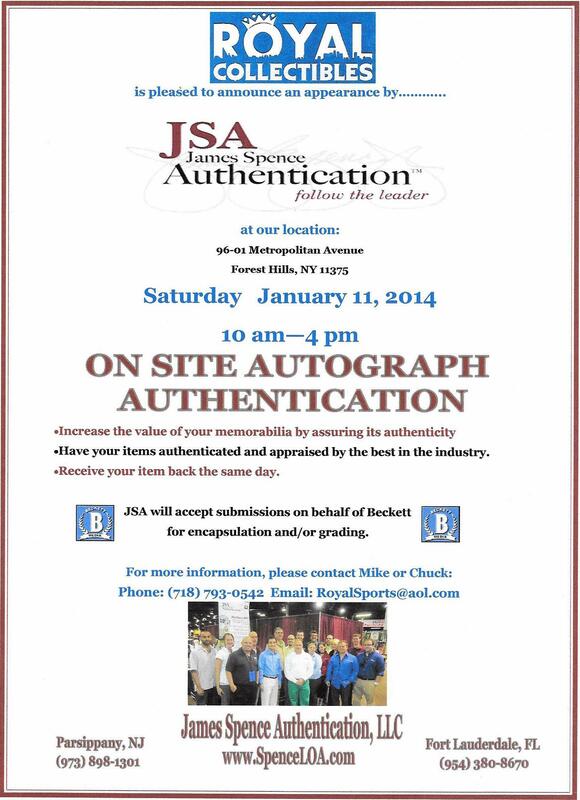 For collector’s who have any signed sports or entertainment items without Certificates of Authenticity, be sure to stop by next Saturday January 11th if you’d like to have your autographed items authenticated by James Spence! Getting autographed items certified will instantly add value to your item by getting a guarantee that it is authentic by one of the top names in authentication! This entry was posted in General Info on January 6, 2014 by admin.